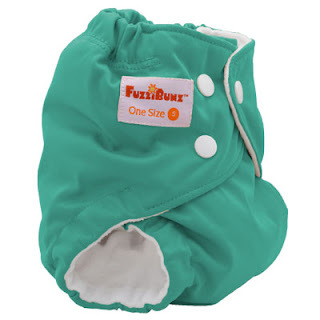 FuzziBunz Cloth Diapers is under new ownership and they are launching an exciting new diaper, the One-Size Adjustable Cloth Pocket Diaper! This diaper comes in size Small and size Large to give you the absolute best fit but will still fit your baby up through potty training. The diaper also features amazing custom sizing options with adjustable leg and waist elastic not found on other diaper brands. mama pure had the opportunity to test out both diaper sizes so you can see the difference in fit to help you choose which would work best for your baby. 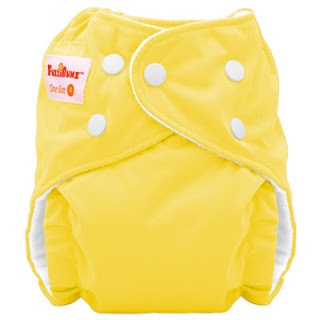 Be sure to read the full review to learn more details about this diaper! 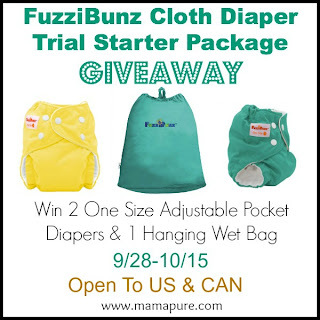 To celebrate the new One-Size Adjustable Cloth Pocket Diaper mama pure has teamed up with FuzziBunz to give away a Trial Starter Package which includes 2 one-size adjustable cloth pocket diapers and a hanging wet bag! This giveaway will run from 9/28 at 12am EST through 10/15 at 11:59pm EST. It is open to the US & CAN. Void where prohibited. Please use the rafflecopter below to enter.